A few posts back, I mentioned that our family will grow by three great-grandchildren in the first part of 2017? Guess what? One of those babies will be my first grandbaby. Does that make sense?? It sounds weird. Probably because I have been patiently waiting for this for a long time. No, not really all that patiently. Sometimes Ray has to give me the stink-eye, reminding me to quit asking my kids about grandbabies. Finally, it’s going to happen– yahoo!! I get to be a Grandma, or Grammy. Probably Grammy, I like that better. My oldest and his wife are expecting their first baby, a sweet little girl, the first week of March!! Awesome news, this is. I have sent a few little things to them for the baby. (They live in Vermont – Clearly, it’s not going to be all that convenient to play with my granddaughter.) Last weekend I really wanted to make something for her. It was raining like crazy though, making a trip to the store somewhat unappealing. (Seriously, it was raining that hard.) I dug around in my closet of more-fabric-than-anyone-could-need and pulled some flannel scraps. These were scraps in every sense of the word. They didn’t really go with anything and were not very big. Certainly I could turn them into something. Babies start out small – these were small scraps, I didn’t need to make anything huge, right? I also found a reasonably sized piece of white flannel and a tiny piece of white terrycloth. After an afternoon of playing around, this is where I ended up. 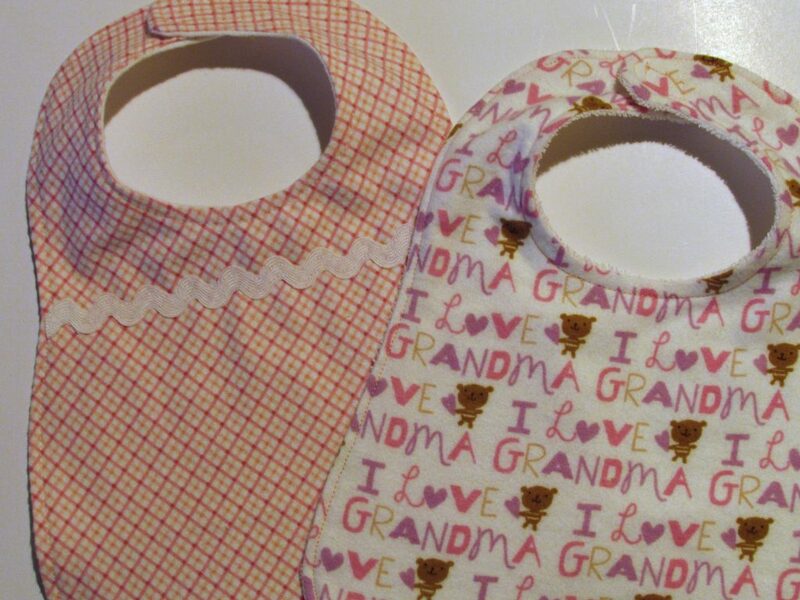 I squeaked one bib out of terrycloth and flannel and the other bib is backed with white flannel and trimmed with white rick-rack. I used velcro closures because I was out of the little gripper snaps and it was raining….. remember? Joy (baby girl’s other Grammy), if you are reading this, the “I Love Grandma” bib is for both of us. This girl is going to have two really cool grandmas. When I first started blogging, I posted a tutorial for burp clothes that wrap the backing to the front, like the green one. If you want to check it out, click here. I can’t wait for this baby’s arrival. My son and DIL are so good about keeping all of us posted with ultrasound pictures and baby bump photos. She is clearly adorable already. 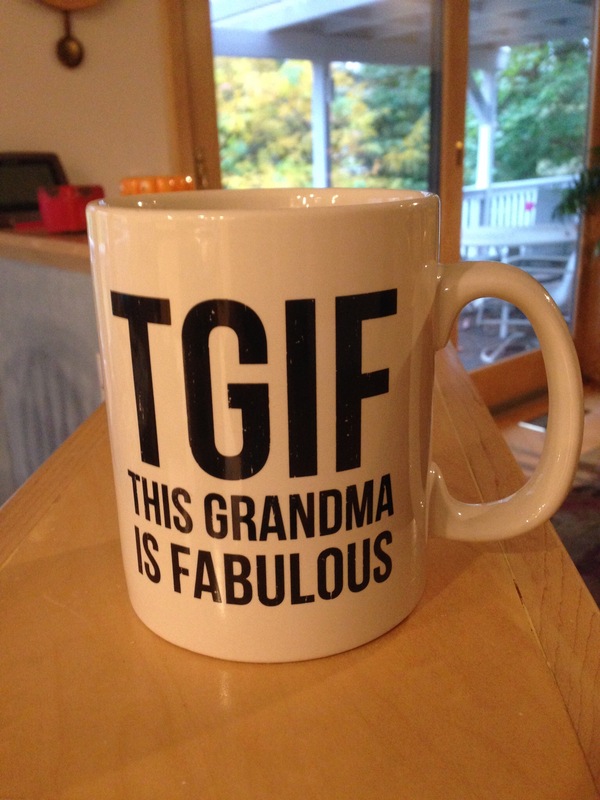 For my birthday last week they sent me a lovely frame that says granddaughter on it and this TGIF mug. It is the perfect mug for me – holds a huge cup of coffee and reminds me I am soon to be a Grammy. Linking to lots of fun places – check them out at the top of the page, under Link Ups. This entry was posted in Birthday Gifts, Family, Sewing Projects and tagged bibs, burp cloth, flannel on November 3, 2016 by Bernie. That is so sweet Yvonne. I would say family is a big deal with us. Having grown up in a big family and one where we stayed actively involved with each other has been really wonderful. It is a bit of a challenge for me having two of my sons living across the country. My hope is that at some point we are all living, at the very least, on the same side of the country-if not closer than that. I had to chuckle when I saw the I Love Grandma fabric you pulled from your stash closet. You were really thinking ahead, having that tucked away in your stash! Hehe. What a lovely gift for the new parents-to-be, and what an exciting thing for all of you! The mug is too cute! Well, I actually had the I Love Grandma fabric leftover from a gift I made for my neighbor two years ago. She became a grandma so I made several bibs for her for her when the baby comes to her house. That is why I only had weirdly sized scrap pieces. But it was fun to have a reason to use the fabric again! How wonderful for you and your family! My Niece had a beautiful happy girl; she is the first baby in our lives in like 25 years so she is not wanting for anything. LOL. 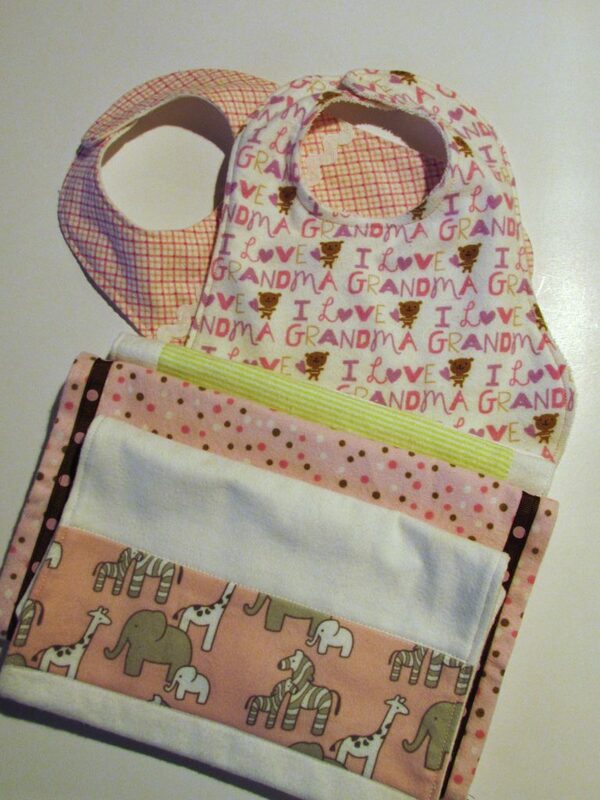 Reading your post, reminded me that I have not made her anything in awhile and bibs are always a great item. I will follow your tutorial for these. I think your new coffee mug is fabulous. Thank you for sharing and have a fantastic creative day! Ah these are sweet and adorable !! Oh wow, Bernie, I mean Grammy, this makes me nostalgic for those bitty baby days. Your projects are adorable. And I love that you pieced them together from scraps you had on hand. They look like you planned it all from the beginning! I bet the days and months are crawling and flying by for you at the same time right now. Such a neat time of anticipation! That is so true – about the time flying by and crawling by at the same time. We have so much going on with one son’s wedding in January and the baby due in March – it is all very exciting. Oh, you *will* be a fantastic Grammy! 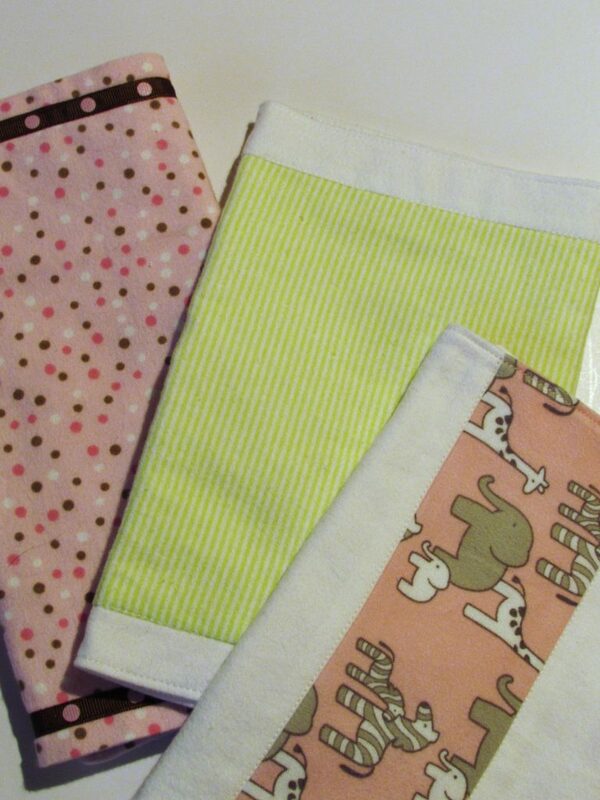 What sweet little things for the baby already. I see a lot more pink flannel in your future! The kids are painting the nursery lavender and white. I have been poking around looking for fun fabrics in those tones. I am looking forward to sewing something sweet. Maybe with some Heather Ross fabrics?? I want you to know that being a Grandma (or Grammy) isn’t at all like they make it sound! It is a million times better!! Enjoy!! Congratulations! What a special time! Before my son could pronounce a ‘G’ to make ‘Gramma’ my mom was ‘Damma’! 🙂 Now at age 10 it’s ‘Gramma’, although we call her ‘Grammy’ too! Thanks Kristi. My kids call my mother Grammy. The babies other grandma uses Nana so I am going with Grammy. Pretty exciting times — I hope all is going well with you and the family. The colors up in Nevada City are stunning right now – Happy Fall! CONGRATULATIONS on becoming a new Grammy! It’s wonderful! I’m sure your DIL and son will be so happy to have them! 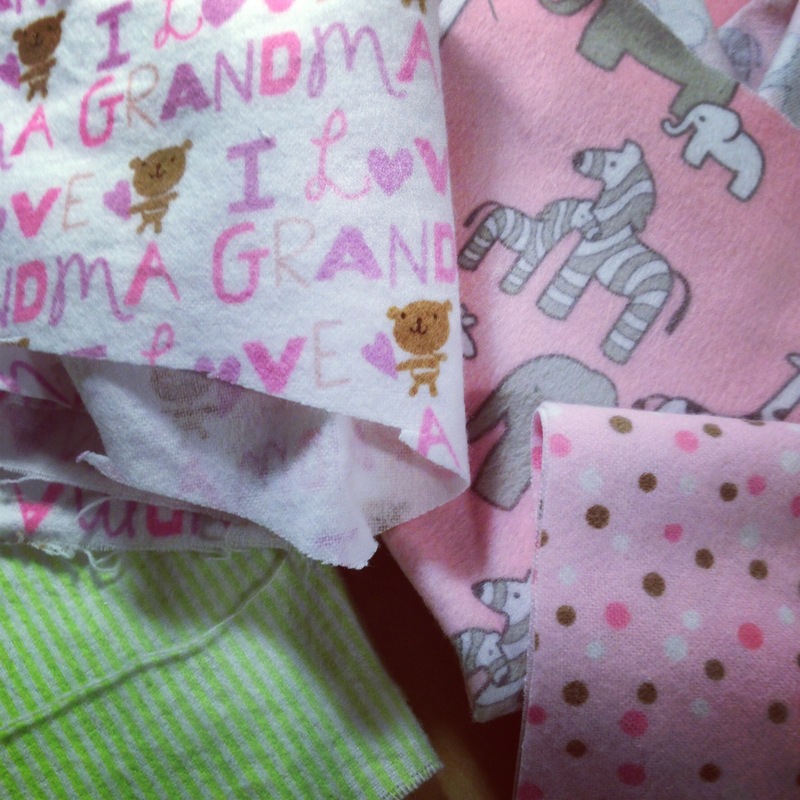 What a creative lady you must be to make such beautiful baby items from scraps! So inspiring! Thank you for sharing! I remember it was so fun to receive some tiny things while being pregnant. It just makes it seem more real as you get the nursery set up and wait for the baby to arrive. Now I need to find fabrics for a quilt and maybe a sleep sack. It is great to have someone new to sew for. 🙂 Have a great weekend Patricia. Ah, that would be a difficult one Karen. You will have to find other littles to be a grandma for. Have a wonderful weekend. It is going to be beautiful here. Hope the same is true for you. Congratulations! What fun baby items you’ve made. I’m sure there will be lots more coming their way. No shortage of love for this lucky baby! Enjoy! I uses the vary same I love Grandma flannel for a receiving blanket. Your baby gifts are adorable. Isn’t it just wonderful anticipating be a Grammy. (I wanted to be called Val…LOL….then okay, Grammy….and our little guy ended up calling me Meme!!!) LOL!!! Now I’ve never heard a sweeter name spoken. 🙂 🙂 I”m so happy for you!! That is so sweet Val. I am sure if this little girl changes Grammy into something else, it will be fine. It is so exciting to see the kids starting a family of their own. They will be wonderful parents. Congratulations! How exciting for you and your family to be welcoming a new little girl. I’m sure that child will never want for handmade treasures and beautiful quilts. You are so right Diana. This just fits in perfectly with my ongoing Pinterest addiction! Now I have baby projects and gifts and toys – etc, etc, etc. Yay! !